Amanda's Quick Bite for Healthy Living: Ava is the Indy 500 Queen and a Young Race Fan! Ava is 11 weeks old today and she has been going to her daycare for 3 weeks now. A few days ago, her teacher told me that Ava is going to be this year's "Indy 500 Queen" for the mini race at school. They picked her because she's the youngest baby girl. They have a race for the kids to kick off Memorial Day weekend and get ready for the big race on Sunday. They do a parade with all the kids and Ava as the queen and ano ther little baby boy was the King leads the way! They gave her a cute little tiara to wear. This was the first time she'd been in a stroller like this without our carseat so we had to pad it all down for her so she wouldn't fall out. She was introduced with her King at the start of the Indy 500 Mini Race! It's a very hot day today so I pulled her out of the stroller to keep her cool after we made it to the back lot for the race festivities. Some of the parents were there to join in a watch their kids "race." The toddlers were hilarious! They had toy carts to push and they did 3 kids at a time. Of course, the toddlers were all over the place and needed lots of coaching. It was really cute!! It was my first parent event so it was fun that I could make it because I was working from home today and it started the normal time that I pick her up. She never cried or got fussy! She enjoyed the parade walk because she likes to look around and be outside. 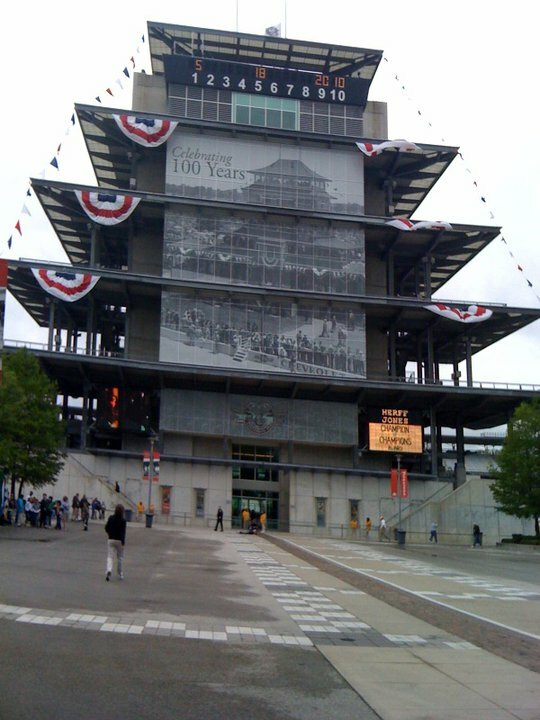 Memorial Day Weekend Plans: Ava's Daddy is proud of her because he's a huge Indy 500 fan. In fact, Aaron took the day off of work today to go to Carb Day where the drivers practice and have Pit Challenges on the Track. Aaron will be at the race on Sunday, meanwhile Ava and I will be up at the lake visiting her Grandma and Grandpa Berkey! We plan to help celebrate Colt's 2nd birthday hang out with Betsy and her kids. The youngest, Sam, is only 4 days olde r than Ava. They are destined to be good friends! I'll be watching the race up at the Lake with Ava cheering on the Andretti Autosport Team! ExactTarget just signed a sponsorship with Andretti and we've had Michael speak at many of our events, including our Sales Kickoff in February. There is a demo Indy car in ExactTarget orange with the Cotweet logo. Andretti team driver, Ryan Hunter-Raey was a surprise guest speaker and I got his autograph at a team offsite meeting last week at the Track. 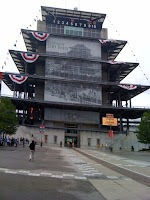 Here's the picture I took of the "Pagoda" tower at the Track during our offsite. Racing fever in Indy is so fun and I'm glad Ava got a taste of it!